“In the unforgiving pursuit of safer handling techniques, AES have recently trialled the revolutionary new glazing robots from Danish manufacturer Winlet. 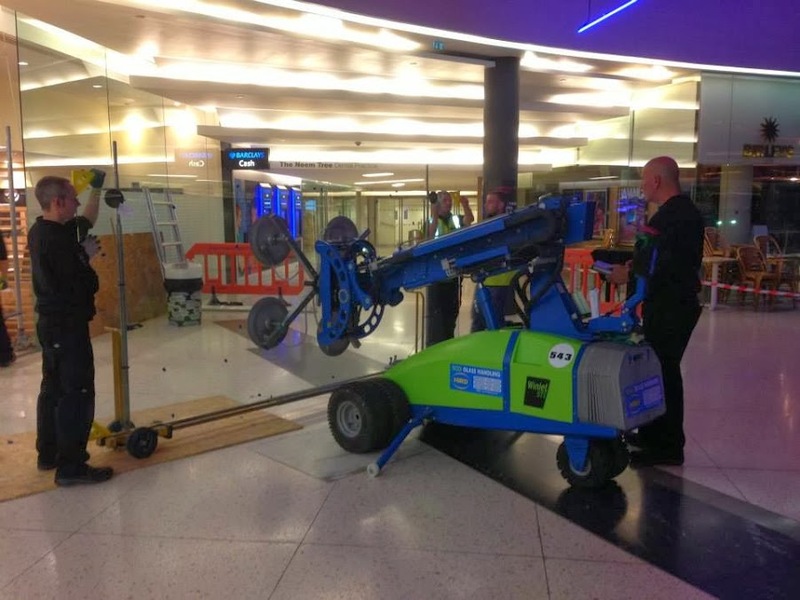 Thanks to the excellent capabilities of their new glass handling and lifting machines, particularly within confined spaces, health and safety at work can be dramatically improved”. 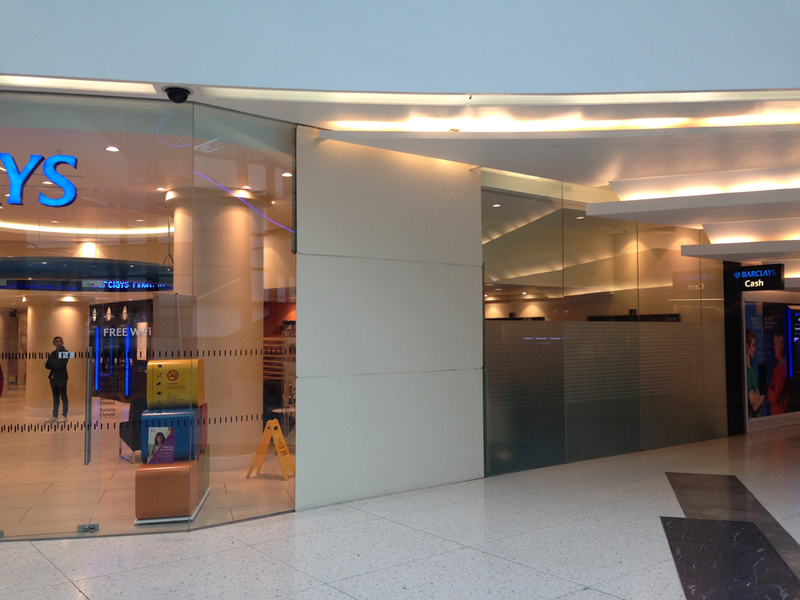 Scope of works: To reglaze a 15mm toughened glass panel measuring approximately 4.5m x 2m and weighing over 325kg at lower ground level. 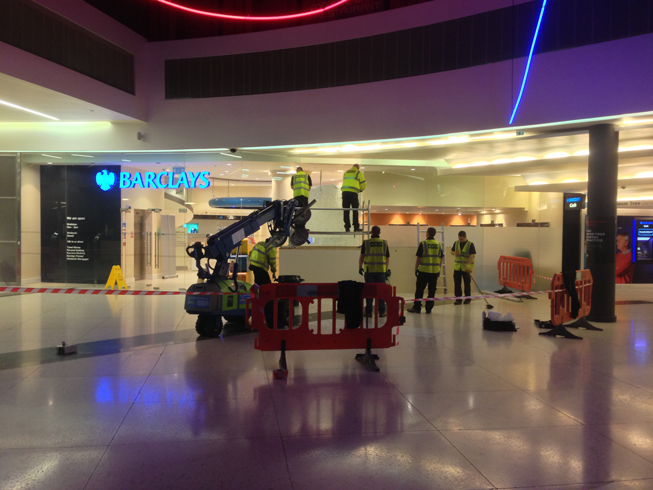 Following a detailed survey it was clear from the offset that there were defined hours of operation, a confined working environment to contend with and multiple access issues to be considered before any work on this project could progress. 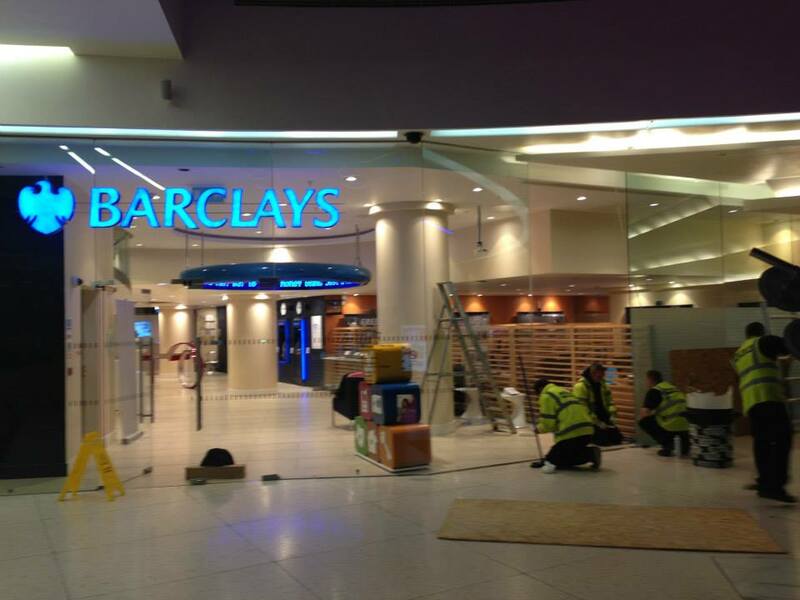 The pane of glass to be replaced spanned from floor to ceiling, and was situated on the lower ground level of Barclays prestigious global headquarters, fronting onto London’s docklands. The only obvious point of entry was an underground car park to the rear of the building. 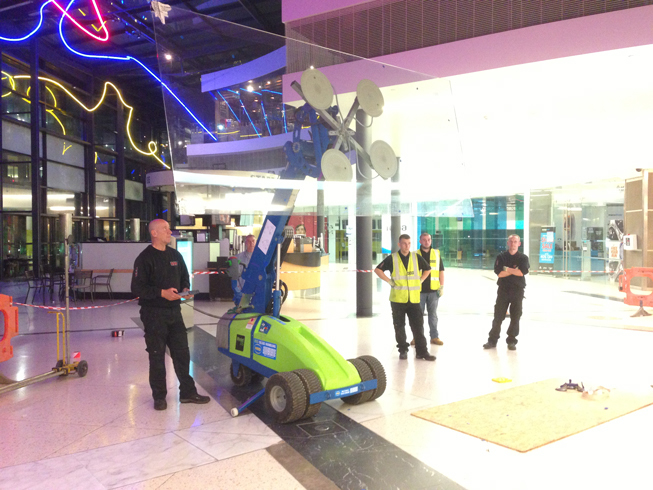 Having examined a variety of mini cranes and hoists a clear choice emerged, the Winlet 575 window robot, which can lift, rotate, transport and install glass weighing up to 575kg. 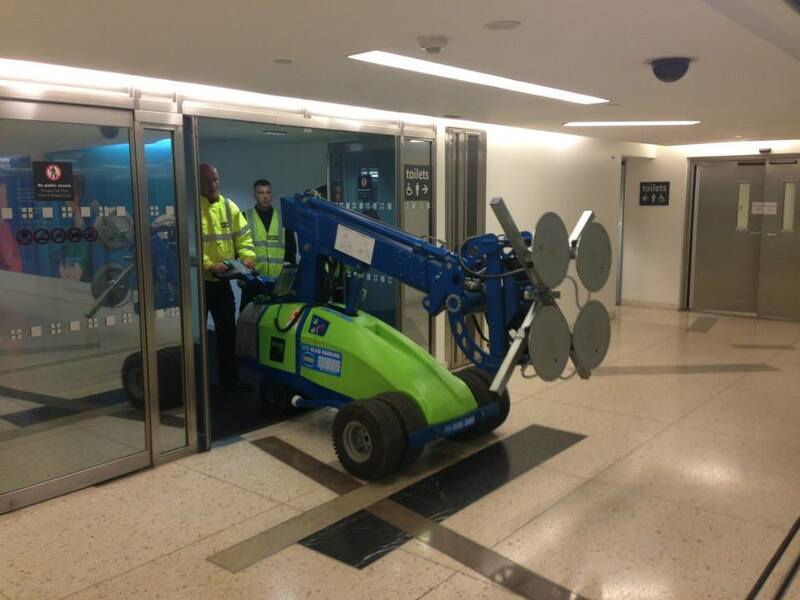 Due to it’s compact design it easily fits through narrow doorways and can work in confined spaces as it features a telescopic boom, as opposed to a regular crane boom and jib. The low weight of the Winlet 575 also makes it possible to use it where heavier construction equipment cannot be used, due to surface pressure. “The overwhelming advantage however is the dramatic increase in health and safety that the Winlet 575 offers”. “The most advanced window lift on the market,with six hydraulic functions”. The most advanced window lift on the market. With a unique compact design, superior range and with six hydraulic functions the job can be carried out safely, without back injuries and on time. 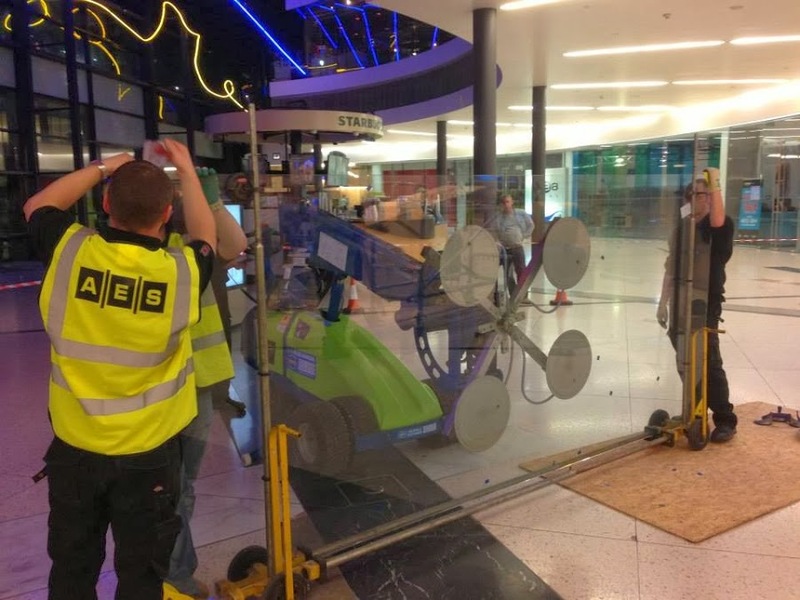 This new technology allows our engineers to install previously problematic glass panels with virtually no manual handling and without the risk of back injuries caused by lifting whilst remaining a safe distance from the lifting operation. 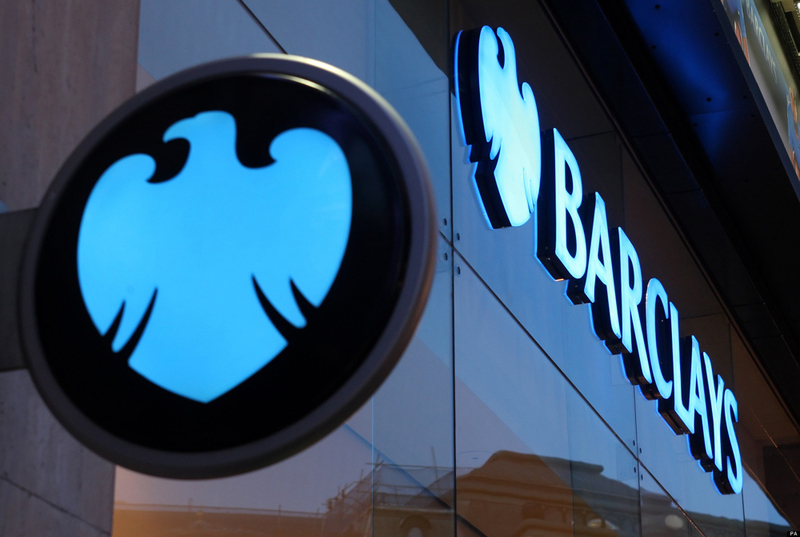 A real breakthrough that we’ll be seeing a lot more of in the future. Welcome to our new commenting tool enjoy!